It is very important to know what the current market conditions are when looking for profitable stock picks. Why? It is much harder for every one of your best picks to rise in price if the market is in big decline or worse – in downtrend. When the equity market is in an uptrend then it is possible to expect that the price of best picks selected by the process above will go up much higher. So the first important task before you start to select the best stock picks for your trading or investing strategy is to understand what the actual situation is on your preferred stock market. 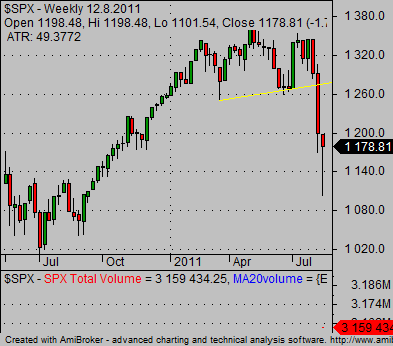 If you trade US exchanges you have to check the S&P500 market index. The situation of this index represent good picture of the broad US market mood. 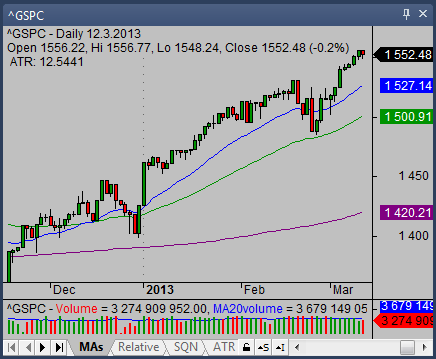 As you can see, market conditions on the chart above are not very favorable to long based trades. So if you want to buy something in such a situation, select really strong stock picks. I also recommend modifying your position size. It is wise to open half sized position in a bearish trend. It decrease a risk when trading against the prevailing trend. It is also good time to consider some short sell stock picks for bearish type of trade. Such a trade in negative market environment could be more profitable than a bullish trade. The chart show bullish situation. It is ideal environment for bullish trades. Finding a good stock to buy is much easier and it is also much easier to manage bullish trade in this situation. You can trade full position size and in some cases be aggressive and make several trades during share price uptrend.